Congratulations to Dr. Janie Avant, Teacher of the Year at Arcado Elementary and finalist for TOTY Gwinnett County! For 2019 we will be hosted once again by the Snellville First Baptist Church. For more information or to register for the 2019 pageant please go to our Pageant page. Our next speaker session for 2018-2019 will be a panel presentation on supported living options on April 25th. Click here for more information and to RSVP. Mark your calendar for March 22, 2019. GAP is partnering with Gwinnett Co. Parks & Rec. for a fun night at the Lilburn Activity Building. GAP/GMST congratulates Katy Wilson, 2017 Honorary ESPY Award Winner! Katy appeared July 11th on WSB-TV. The ESPY awards on July 12th had a special recognition of Eunice Shriver Kennedy and Special Olympics. Click here to see Katy's interview with Channel 2. GMST thanks the Cobb Just People, the Atlanta Thunder, and the Atlanta Gladiators for visiting Floor Hockey practice at Annandale Village in 2018! 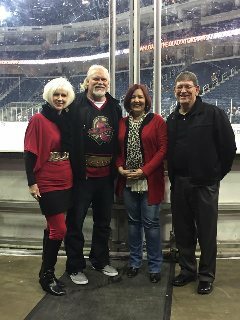 Congratulations to Jeff and Renee Jansma (GAP Board member/Supporter) for their group's beautiful rendition of the National Anthem at the Atlanta Gladiators game on April 7th, 2018 and on December 27, 2016. Well done, Master's Voice!! Flag Football starts Sunday, February 24th for all teams. Practices are held from 2:00-4:00 PM at Rhodes Jordan Park, 100 E Crogan St., Lawrenceville, 30046, this year on Soccer Field # 2. Swimming begins on Sunday, February 3rd from 2:00-3:00 at Swim Atlanta, 4850 Sugarloaf Parkway, Lawrenceville, GA, USA. Volleyball will practice at Mountain Park First Baptist Church on Thursdays beginning on Feb. 21st, 6:30 - 8PM. Kool Kats League Bowling - Stars and Strikes in Buford on Mondays beginning at 6:00 PM. GMST Teams will be competing in Flag Football, Swimming, and Volleyball at the SOGA Summer Games May 17-19, 2019 at Emory University. The Kool Kats Bowlers ages 22+ will complete at the Masters Bowling Tournament August 16-18 in Warner Robins, GA.